Another year is coming to an end we always like to inform you of how we see the market in the future and what we are planning for 2016. The year has been far busier than many people in the industry predicted it was going to be. With interest rates staying at a record low, a shortage of properties coming to the market and with more buyers registering activity has been extremely good. We started 2015 by opening our 3rd HOME office based in Monton and I am pleased to say that we have steadily grown throughout the year. Together with Stretford and Monton offices we have a unique network to advertise your property. The more recent of our additions to our marketing coverage has been the installation of our interactive Touch Screen at the Urmston office. We always endeavour to be ahead of our competitors and with this 24 hour a day marketing tool I like to think we have delivered. 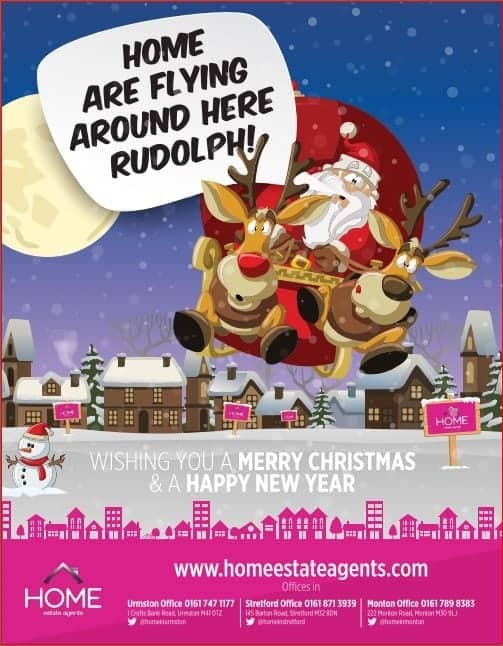 Unlike many other agents in the area we chose to stay on all the major websites this year and again I feel we have proven right in this decision. We will continue to look at new technology through 2016 to ensure the properties we market are advertised to the highest standard possible. The lettings arm of the company continues to grow and we now manage over 350 properties. As you may have heard in the national press rental incomes are currently greater than in previous years and this trend is apparent in our area. If you would like to find out how much you could achieve in renting out your property please feel free to contact me and I would be happy to discuss your options. Many first time landlords are surprised how simple letting their property is with the help of a managing agent. All in all property is still a sound investment and certainly gives a better return than most banks currently. If you are considering selling, buying or letting a property we would be delighted to discuss how we can help. Contact your local HOME office to start the ball rolling! The last thing to say is from all of us at HOME we wish you a very Merry Christmas and a Happy New Year.